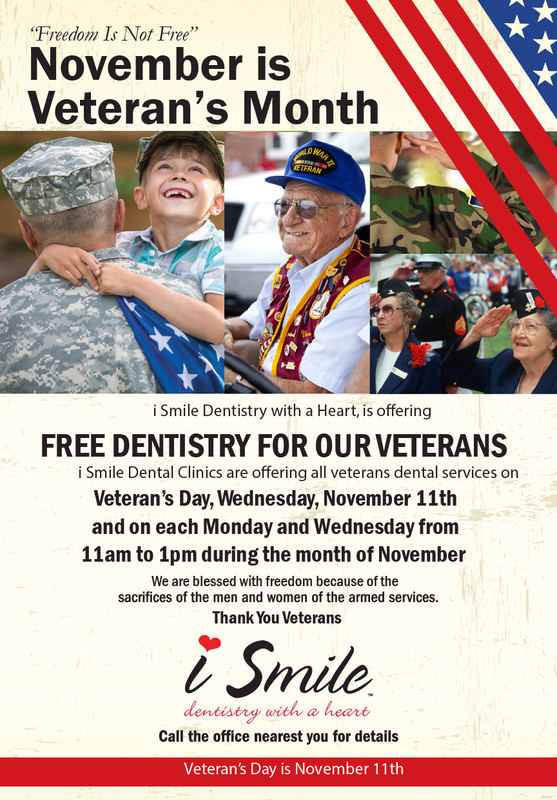 GREAT OPPORTUNITY—FREE Dental Services for Veterans at iSMILES( Dentistry with a Heart) clinics in Phoenix, Tucson, Glendale and Pearce, AZ on Veteran’s Day and each Monday & Wednesday from 11:00 -1:00 in the month of November. I SMILIES has 5 offices throughout Arizona and will offer FREE dental services that can be provided in a half hour appointment including extractions exam, X-Ray, Cancer screening, denture adjustment and implant screening & consultations. Veterans can call for an appointment at 520-334-7765 or visit their website at http://www.ismiledentists.com/specials/ and find an office nearest you. On Veteran’s Day at their Arizona locations if you just want to check out their services feel free to drop by that day for free refreshments and meet the staff and Doctors. NOTE: Most of the staff of iSMILES is either a veteran or had a family member who has served in the military and are very dedicated to helping our veteran community.